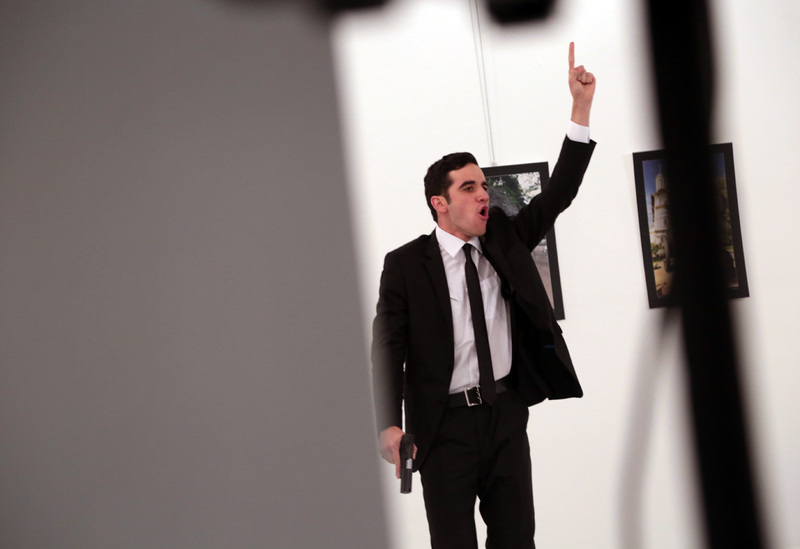 A gunman gestures after shooting the Russian Ambassador to Turkey, Andrei Karlov, at a photo gallery in Ankara, Dec. 19, 2016. The Jaish al-Fatah armed coalition, which includes the Jabhat Fateh Al-Sham extremist group (formerly known as Jabhat al-Nusra, outlawed in Russia), has claimed responsibility for the murder of Russian Ambassador to Turkey, Andrei Karlov, the Al-Youm Al-Sabea newspaper reported in its online version on Dec. 21. A copy of the statement by this alliance of extremist groups, which speaks about its responsibility for the crime in Ankara, has been posted on the newspaper’s website. Russia’s Ambassador to Turkey, Andrei Karlov, was gunned down on Dec. 19. An armed man whom the police later identified as a 22-year-old police officer opened indiscriminate fire in an art gallery in Ankara where Ambassador Karlov was opening a photo exhibition. Turkish officials said the attacker was neutralized. Apart from the ambassador, the shooter wounded three more people but none of them were Russian citizens. The Russian Foreign Ministry has described the incident as an act of terror.